Processes can be monitored through Workbench and Processes Overview. Repetitive processes can be created, re-used and monitored from Process Scheduling. Easily create templates in Process Templates to re-use them quickly. Notify yourselves or your team of a specific action upon a process with Notification Scenarios. 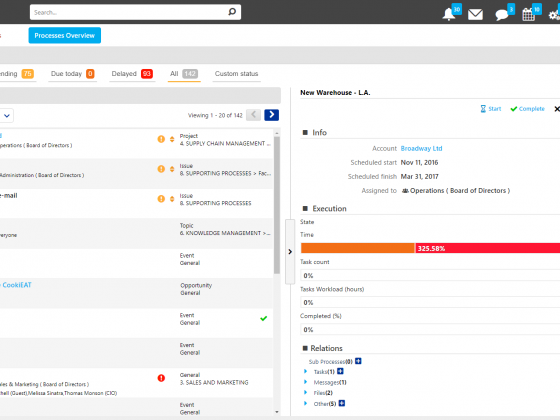 Automate standardized Processes with Workflows. In order to access Generic Processes, go to: Application Menu Icon > Processes> Business Processes. A new Unit Action Tab appears with the name Processes in the Active Units Bar. Start with creating a new process by clicking on the ‘+’ sign in the Unit Title Bar. A new form appears. Fill in the Title of the Process and the Basic Info of the Process. Category: Search for a Process Category based on the Process map and select it or add a new one. See how to add Categories in Data Management. Assigned to: Click on Assigned to field in order to see Comidor Users and Groups. You can assign this Process in as many people or groups as you wish. This means that people you will select here, are those who will be responsible upon this process completion. Select Priority (Low, Normal, High, Top) of the Process. Then, you should set scheduling of the Process. Execution details will be filled in the future, when Process will have been started. Also, you can Link this Process with a related an Account and a Workflow. You may want to add Location Details, such as Country, Address and City information. Complete a Description for this Process. When Region code is set up in Regional Settings, suggested calculated hours give the timeframe of the working hours between scheduled start and end, excluding public holidays etc. You can also link the Process with either a Parent process, a Contact, a Personnel or a Service. Type some related letters and click on search to find an entity. Status field will be later filled, when the process will start. In case, that the Process has already started, make sure you will complete these fields as well. State will be stated automatically as Created when the Process will be created. You may change this later as Confirmed, Scheduled, Running, Completed, Canceled, Paused or Failed. Process State will be changed to Running and Completed automatically on the scheduled start and end dates and times, respectively, provided that you had check Execute automatically field above. Start and End Dates & Times are the execution actual start and end dates and times. They will be displayed when the Issue starts and is completed. Completed (%) is the percentage of Process completion and should be added and managed manually by the Process owner. Estimated workload refers to an estimation of the hours that will be spend for this Process. 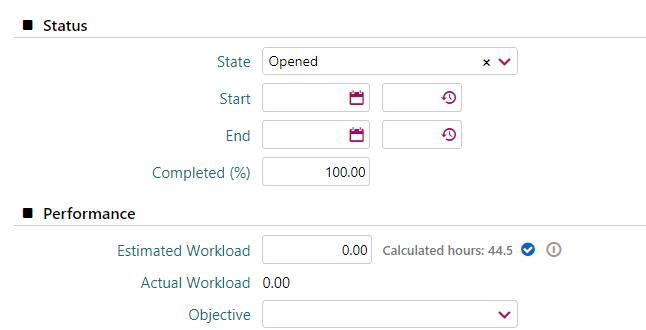 The Actual workload will be later automatically filled, when you complete tasks inside the process and add the actual Process duration, in hours. Finally, link this process with an Objective. Find out more about KPIs here. 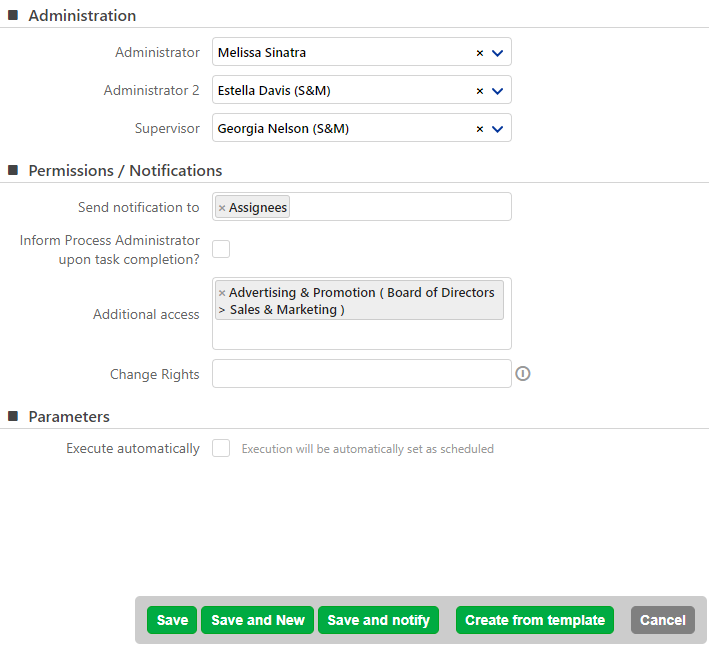 Set users that will be Administrators and Process’s Supervisor. Practically, this means that these users will have access on this process, even if you did not add them in the Basic Info above. Send notification to: Fill in Comidor Users and Groups, you wish to receive notification when someone commented on this Process. Additional access: People or/and Groups that should have access on this Process, without being necessary to act upon it. Change rights: People or/and Groups that could edit this Process details in the future. The choice “Everyone” is by default. This means that Everyone who has access on this Process will have the right to modify it. Finally, click on Save to save the Process, on Save and New to save this and start creating another one, on Save and notify when you need to save but also send a Notification message to appropriate people, or cancel to cancel the procedure. Create from template option is available when you have already added a Generic Template in Process Templates Unit in Automation-this will help you have ready-to-start Generic Processes with specified people participating on them. In order to access Processes, go to: Application Menu Icon > Processes> Business Processes. A new Unit Action Tab appears with the name Processes in the Active Units Bar. After creating the Process, users can edit and monitor it through Processes Overview and Workbench units, too. 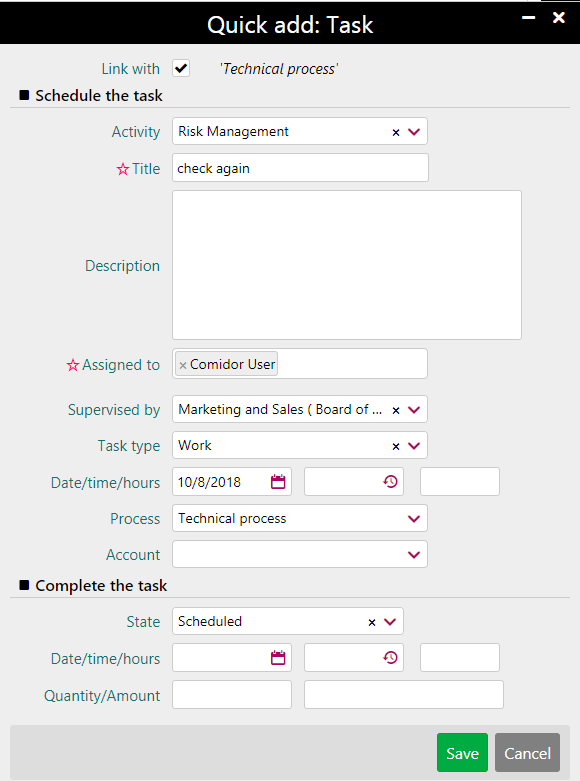 Click on a Process from the list view in order to enter and manage it. A new Unit Action Tab appears with the name of the Process in the Active Units Bar. Click on the pencil button to edit the Process details. Edit button only appears to people that you have added in Change Rights field of a process. Apply any changes in the fields that are explained further in Create a Process and click on Save or Save and Notify depending on whether you would like simply to save or send a Notification message as well while applying changes. Click on the Actions button to open a list of actions. Firstly, the Refresh button gives an instant updated view of this Generic Process. Select Delete to delete this Generic Process. A check pop-up window appears. Click on Link with in order to Link this Generic Process with any Comidor entity (other process, account, contact, project, opportunity etc.). A pop-up window appears. Click on Notify in order to Notify a person or group of people regarding this Generic Process. Watch out to Notify someone that has access on this Process. Create a Duplicate Process based on this one. Also, user can Print notes added on the discussion board of this Process. Pop-up appears prompting you to select timeframe of notes report you are about to see/print. 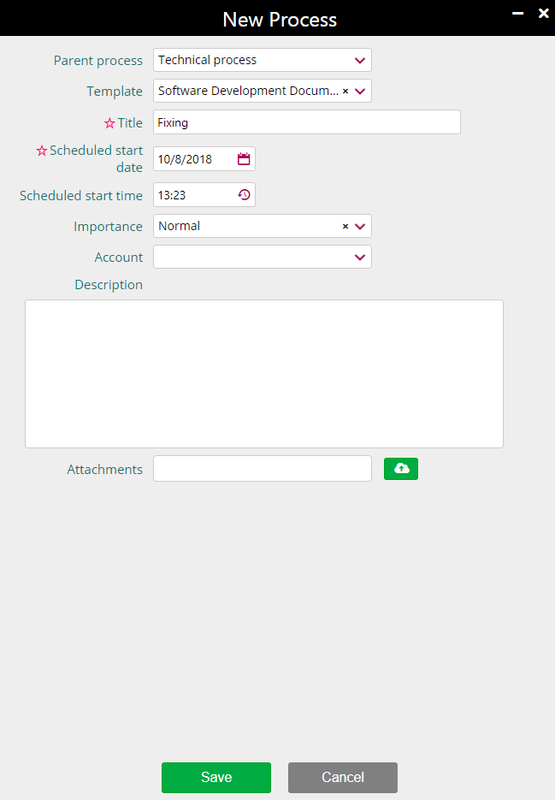 Make a copy in process Scheduling will copies this Process in Process Scheduling unit, in order you to be able to re-schedule it for the near future with repetition or not. Change Process state simply by clicking on the state button on top right. Then select the state of the process. Select Confirmed or Scheduled in order to verify and schedule respectively the Generic Process that is about to start. A new pop-up window appears, where you can now set a different start time and date or take as granted the suggested time and date. Click on Save. Select Running and a new window appears, where user can set the execution time. Select Paused in order to pause a Generic Process for some time. A new pop-up window appears and user can see the update in execution information. Click on Failed on a Process that failed to complete, update start and end dates and times, duration (suggestion of tracked or computed duration are available) and quantity and click on Save. See the update in Generic Process execution information. 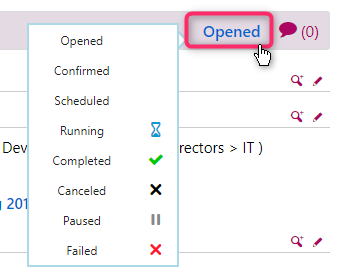 Click on Canceled on a Process that has been canceled, update start and end dates and times, % of completion, duration (suggestion of tracked or computed duration are available) and quantity and click on Save. See the update in Generic Process execution information. Click on Completed to set a Generic Process as complete. Update start and end dates and times, duration (suggestion of tracked or computed duration are available) and quantity and click on Save. See the update in Generic Process execution information. Get a full Process analysis in Dashboard. You can monitor in which stage is the process right now and which stages have left. Make sure, you have selected the workflow, when creating the particular process. 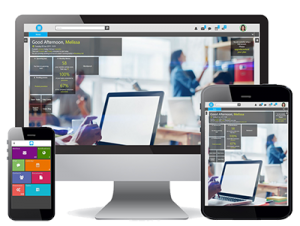 Furthermore, user can see information such as % of Process completion, time tracking, task count tracking and tasks workload in hours from this point. Tasks Workload (in hours) is the # of actual Task(s) duration divided by the scheduled Process duration and Completed percentage is the aforementioned field of the Generic Process that is filled by the user. Click on Subprocesses at the side-box, in order to see all the processes that the main process includes. You can easily create a new subprocess, by clicking in the ‘+’ button. A new window appears and you have to fill in all the required fields. By default, the check box that links this new subprocess to the Mother Process is pre-checked. Then, click save to proceed, or cancel to discard the changes you have made. Opportunities in Comidor help you organize your potential deals. Hence, in the Opportunities tab, on the left side box table, you can view all the opportunities related to this specific process. In this view, you can see the basic details of the opportunity, such as Title, Final and Target Revenue. Users can create an opportunity simply by clicking on the ‘+’ button. After that, they can fill in the appropriate data like Basic info, Scheduled and execution time and date, duration and make the necessary linkings. Get more information about Creating an Opportunity in Customer Relations Management. In Projects tab of the left menu, user can either see an already linked project to the current Process, or create a new one. You can find briefly details of the projects here. In particular, you can see the title, the Financial and the Target Revenue of the project. Users can create a Project simply by clicking on the ‘+’ button. A new tab opens in Projects. Here, they can fill in the appropriate data like Basic info, Scheduled and execution time and date, duration and make the necessary linkings. Learn More about creating a Project. 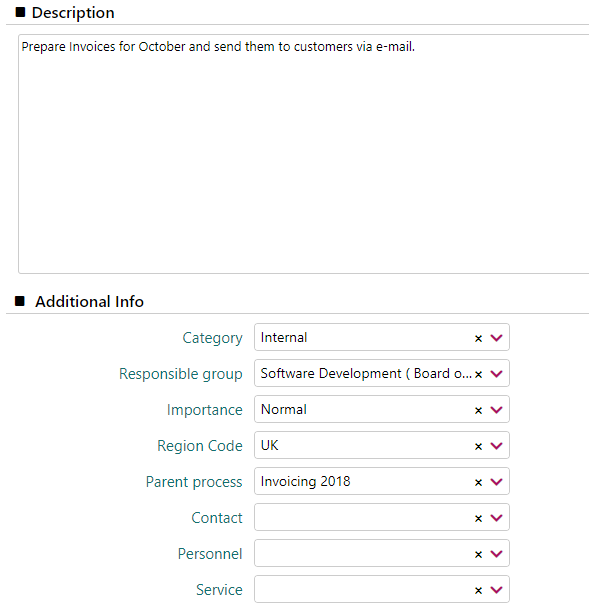 Click on Notifications at the side-box to see all the Reminder – notifications that the system created and sent regarding this specific Generic Process. The notifications may refer to process completion, process start, process delay or time before its start. You can see these notifications’ date and times sent, whether they you have read and removed them, too. 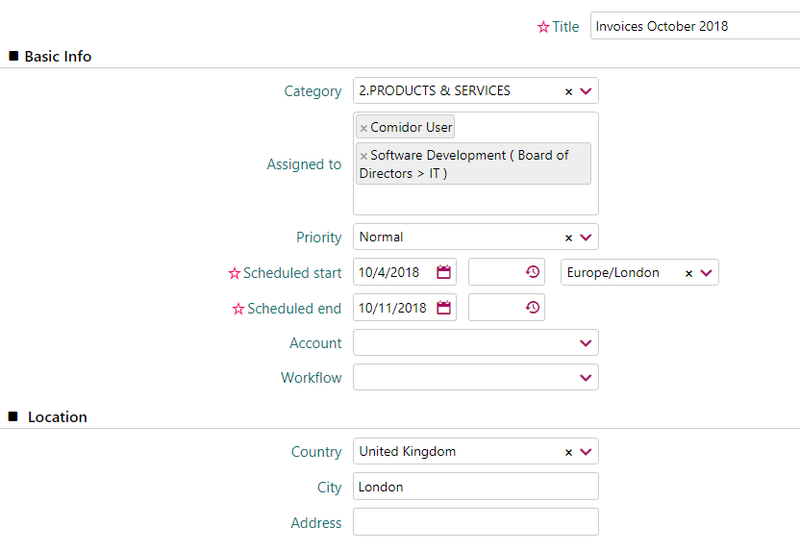 Last, you can click on Tags and Links in order to give a Tag on this Process and Link it with other Comidor entities such as Accounts, Contacts, Projects, Opportunities, Messages, Files etc. Tasks setting is necessary to schedule work that should be performed by multiple people and groups. Add a quick Task by clicking on the ‘+’ at the bottom right of the Process, being in the Summary tab. A new form opens. You can create multiple Tasks, enter and monitor them from this point. 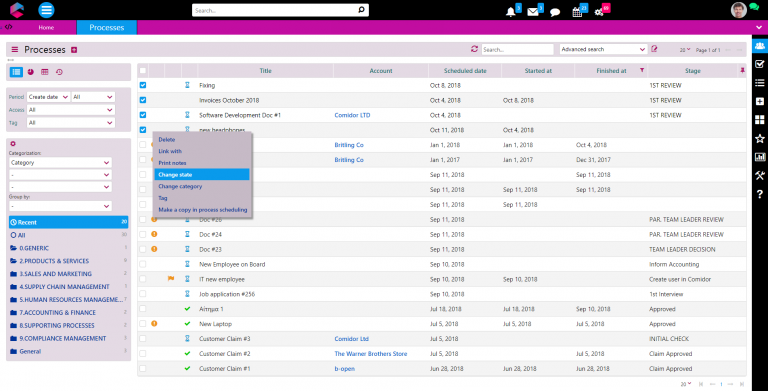 Click on refresh to instantly see all new-added tasks in the form. Also, you can easily upload related files either straight from your Desktop, attach an existing in Comidor File, or a File URL by clicking on earth button. Click on an already uploaded file to Open it (downloading and previewing of current and previous versions are available), Rename it or Delete it. Users that have the right to view a Topic, can also read any discussion that occurs inside that Generic Process in Notes. Simply add a Comment using a simple or enriched HTML Editor (Open editor). Users can click on Refresh to see new comments. Click either on Show More or Show Less to see the amount of comments they wish. Only people and people in groups that you have added in “Send Notification to” field, will receive notifications in the Notifications Bar about these comments. 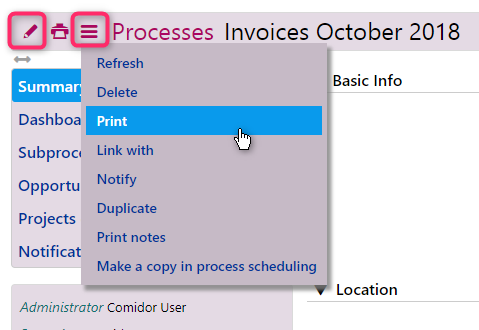 From the Application Menu Icon, go to Processes > Business Processes. A new Unit Action Tab opens with name Processes. 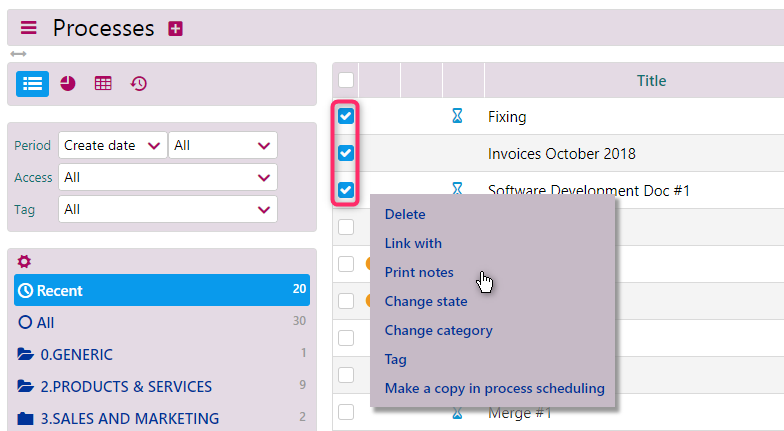 In the List view of Processes, check multiple Processes and perform actions upon them. Select multiple processes and click on Delete to delete many Processes in one move. A check message appears in a pop-up window prompting you to be specific and check what Processes (and their sub-processes) you would like to delete. Choose between “Yes, delete all”, “Yes, but just those selected” and “No”. Click on Link with to Link the Processes with a Comidor entity, such as another Process, Opportunity, Survey, Project, Account, Contact, Message, File etc. Select Print notes added on the discussion board of this Generic Process. Pop-up appears prompting you to select timeframe of notes report you are about to see/print. Press Change state and A new pop-up window appears. Then, click to expand the list, select one state and click on Ok. Changes will occur. Change category. A new pop-up window appears. Then, click to expand the list, select one business category, and click on Ok. Changes will occur. 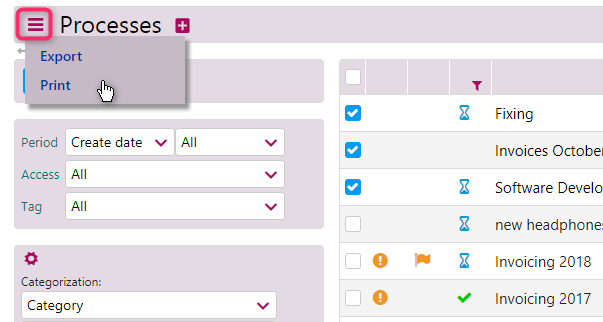 You can select Tag, in order to apply multiple tags at once. Finally, select Make a copy in Process Scheduling, to copy this Process and transfer it to Process Scheduling unit. There, you can set a repetition for it. In the Processes, main view, click on the Actions button and select between Export or Print buttons in order to export or print the list of the Processes that you are viewing at that moment or all. Make sure prior to this action that you are viewing the searched or filtered or all Processes. You can simply sort them and/or group them by the way you wish. Check Data Management options for more information about all these options below.